Let me just say that this post is in no way intended to offend any of the radiologists out there who may stumble upon this blog. So the kid we saw in clinic last night came back this morning. He felt much better. He was playing. He was drinking. My attending decided to get a chest x-ray. The wet read on the x-ray by the radiology resident was that there was no consolidation, no pneumonia. He still had crackles in his right lung fields, mostly over the middle lobe. My attending and I scratched our heads for a moment, then looked at the x-ray ourselves. The right heart border on the AP projection was fuzzy, a classic sign of a right middle lobe pneumonia. The lateral projection had a clear consolidation in, you guessed it, the right middle lobe. We prescribed another 6 days of antibiotics and sent them home. The moral of this story is to trust your physical exam, as well as your own read on an x-ray. You are your patient's best advocate. A 3 year-old came in to clinic today, referred from a family practice clinic in the area, because he was dehydrated from a presumed gastroenteritis. Here in our tranquil, sleepy town, we see kids who would normally have to go to the emergency room up in our outpatient clinic as long as things aren't too too bad. This little guy needed IV fluids, but maybe not more than that, so was triaged up to clinic. We gave him 2, 200 cc boluses of normal saline and started maintenance fluids while we monitored his progress in clinic all evening. Even after the 2 boluses, he still looked pretty punky, not fussing too much when I would come in periodically to examine him. After he'd gotten the full 400 cc, I listened to his lungs. Lo and behold, he had crackles! He had been so dry that we hadn't heard his pneumonia. One shot of intramuscular ceftriaxone coming right up. Thirty minutes later, he looked a little better and was asking to go home, which we took to be a step in the right direction. He fussed and fought with our nurse as she tried to take the tape off his arm. Another sign that he was feeling a little better. He wanted chocolate milk, too. I mean, who wouldn't after the day he's had? So, the moral of this story is that sometimes severe dehydration can mask a bad lung infection. The physical exam is a nebulous target that you'll miss completely if you don't pay attention. If we hadn't heard those crackles, we would have just sent him home and called it a gastroenteritis. He'll be seen in clinic again tomorrow morning. There's no rest for the weary. Somehow, I don't mind, though, because we caught this one and know how to fix him. Even after a long day of not-so-clear-cut-cases, that feels pretty good. Our grand rounds speaker this morning was Edward O'Neil, MD, one of those inspiring people who have transformed their lives in an effort to make the world a better place. His talk painted a bleak picture of the world in which we live. Poverty, war, disease, despair, apathy. Yet, as bleak as it was, it was also hopeful. There are no simple solutions, no matter what your perspective. But one person can make a difference. I ask you...if Bono can convince Jesse Helms that withholding funding for AIDS relief in Africa is wrong using scripture, anything can happen. I plan on reading O'Neil's two books, about to be published next month, Awakening Hippocrates and A Practical Guide to Global Health Service. I also encourage anyone interested in global health issues to read Mountains Beyond Mountains by Tracy Kidder about Paul Farmer. Another truly inspiring individual who has changed the course of global public health. There has been one silver lining to this ambulatory month...the ability to schedule patients for follow-up. Usually, in our weekly continuity clinic, we hope to see our own patients for well-child care or some neat, easy-to-address-in-30min problem, like ADD or thumb-sucking. Most of the time, we end up seeing some other resident's patient and then never see that family again. This month, however, since I am here every day, all day and some nights as well, I have been able to do the quick follow-ups for sore throats, ear infections, etc. I've even been able to manage a kid with recurrent nephritis secondary to Henoch Schonlein purpura. The short answer is that it's a systemic small vessel vasculitis, or inflammation of the small blood vessels in your body, from your skin to your intestines. No one's really sure what causes it, but it may be triggered by infections such as strep, chicken pox, or hepatitis. 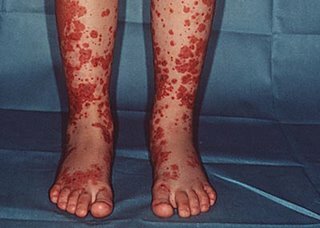 It usually gives you a characteristic rash on the legs/feet, as well as joint pain, abdominal pain, and blood in the urine. The blood in the urine is caused by small vessel inflammation in the kidneys, or nephritis. Usually, it goes away in 4-6 weeks, but can recur. That's what happened with this kiddo. She had it in September, including the nephritis. Six months later, she had similar abdominal pain that prompted a trip to the ED, where they dipped her urine and found a lot of protein and a lot of blood. Recurrent HSP nephritis. I've been able to see her twice weekly for the last 3 weeks. Once, I was unable to see her and she ended up seeing my senior resident. 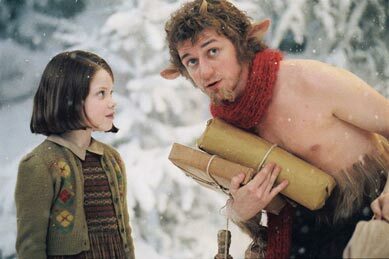 She thought he looked like Mr. Tumnus from The Lion, the Witch and the Wardrobe. To his credit, his ears aren't that big, but the hair is quite similar. That, and I'm pretty sure he's not a faun. We now call her Lucy, which amuses her to no end. That's the best part of medicine, getting to know these great kids and their families. Next month, I go back to the inpatient floor, which has its own rewards, as well as frustrations. I returned home the other day after a particularly long day of complicated SDAs to find a belated birthday card from my best friend. Enclosed was a picture of us at her wedding, standing arm in arm as we did when we were kids. Ever since, I have been pondering best friends and what that means. I have found that people use that term too carelessly, too superficially. A best friend is not a fair-weather friend. A best friend is not someone on your holiday card list that you think of once a year. A best friend is someone who has weathered many trials and tribulations with you. She shares your panic when you hear on the news that an escaped convict was last sighted in your hometown and races over to your parent-less house with a butcher knife...just in case. She fights with you about silly things, but is always there when you need her to ask a boy if he'll "go" with you, because she is much braver than you. She inspires you to try new things, constantly marveling at your achievements, no matter how small, and rarely acknowledging her pivotal role in who you have become. I wonder if it is possible to form such close relationships as an adult. Or is it relegated to childhood, when you are learning as much about yourself as each other? Note to self...never go to the market when you are ravenously hungry. No good can come of that. I now have Jalapeno Cheese Puffs, so Turboglacier better get here soon. 1. Bronchiolitis in a 5 month old...the minute I walked in the room and heard his cough, I knew it was bronchiolitis, likely RSV. 'Tis the season! 2. Dog bite in a 2yo...they're getting rid of the dog! 3. Recurrent Henoch-Schonlein purpura with possible renal involvement...this was a tough one...spent most of the afternoon tracking down her old records, talking to her PCP and interpretting her lab results from our visit this morning...thank god for no-shows, otherwise I wouldn't be going home any time soon.